Recently I had an opportunity to visit Florida. 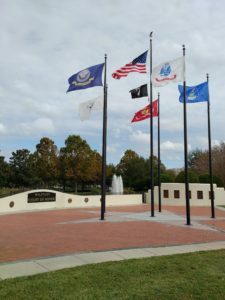 While I researched and found a number of military and aviation museums around the state, I did not have the opportunity to visit many of them. 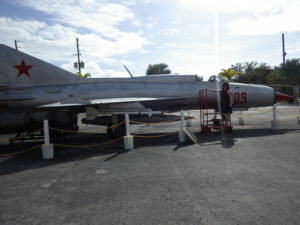 In fact, I only visited the one museum, the Armed Forces History Museum in Largo, Florida. 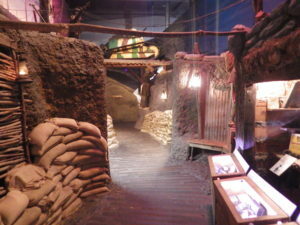 This museum did not have a concentrated look at one area of history or one branch of the armed forces, but rather had a greater focus on looking at many of the armed conflicts the United States has been involved in since the First World War. 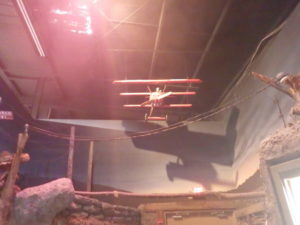 Many part of this museum were wonderfully immersive, from wandering through the trenches of the First World War, to standing around models of the ships attacked at Pearl Harbour with a projection of planes flying on the day of the attack, to resisting the urge to swat at mosquitos while walking through a Vietnam swamp. The displays are wonderfully done, and done with a passion that is not always seen in museum setups. As a Canadian, the strong American patriotism is something a little foreign, but I believe that seeing it in action in this museum has given me a better understanding of how I can shape my own work to better suit how many Americans feel the USAAF should be memorialized. In fact, the monuments that I saw while travelling around Florida gave a different perspective when compared to the small war memorials that can be found in every community in Newfoundland. I found many of the monuments in Florida were much grander, and many of them were also much newer than those erected after the First World War here. From a research perspective, I very much enjoyed the exhibits that showed the kit bags used by Second World War airmen. 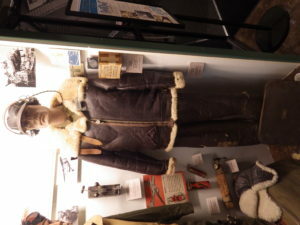 In particular, the exhibit featured the uniform and kit of a B-24 Tuskegee airman. Such exhibits help me a great deal, especially when thinking of site visits where personal effects and parts of kits have been found. I will be sure to use the photographs I took for future reference. As for the history enthusiast in me, I very much enjoyed the room featuring uniforms from across the Armed Forces and across the years. I showed the evolution of many of the uniforms, and the changing roles of women within the Armed Forces. 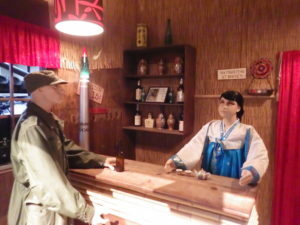 As well, as someone who has watched M*A*S*H quite a bit, their detailed section of the Korean War was nice to see. It is often a conflict neglected in military museums, but this museum very much showcased it, and I learned that Rosie’s Bar was based on an actual place (to make my geeking out over M*A*S*H complete, I found a candy store that sold Grape Nehis!). 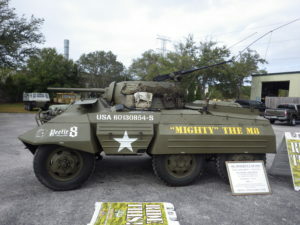 There are other activities that are available for additional fees, such as simulators and the opportunity to ride in a WWII M8 Reconnaissance Vehicle. But before you try to visit, check the website. Sadly, I would like to recommend this museum to anyone in the Largo/Clearwater Region, but the museum’s main benefactor recently passed away, and although this is a world-class museum (in my opinion) it is not sustainable if running solely on admissions. Therefore, the museum is currently in the process of closing. 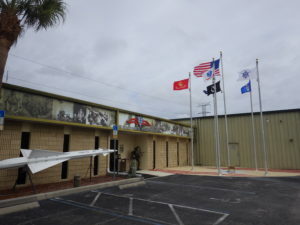 I am grateful for the opportunity to have visited the Armed Forces Museum in Largo, and while I did not get to any of the better known facilities, am happy I visited this one before it closed. 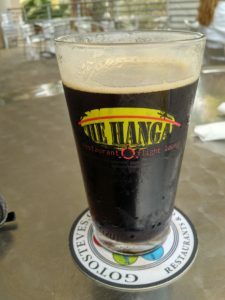 If you are in the St. Petersburg region, I would highly recommend visiting The Hangar restaurant. 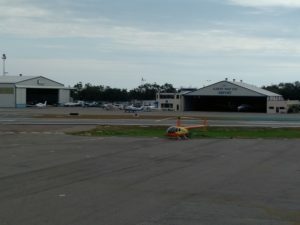 It overlooks Albert Whitted Airport, a small, active airport. While having a delicious burger, I had the opportunity to watch what I can only assume was a new pilot practicing takeoff and landing. It was a wonderful experience, and made for a great afternoon (plus the food, beer and service were wonderful!). If I get to go back again, I will see about contacting the Albert Whitted Airport Preservation Society about a tour. This was originally posted on 10 July 2015, and because I lost all of my old content, I am reposting it. In my last attempt at a blog, I tried for part aviation, part travel, but now I’ll leave the travel stuff to twitter and my personal facebook. My plan this year is to stick to aviation related posts. The only two aviation posts that I managed to salvage are this one and one about the Cochrane Pond Hawker Hurricane, which I will also repost. There are a few posts from my first blog on blogspot which I will also eventually repost here. Sadly, I have lost any and all comments from this blog, including a wonderfully detailed one about Le oiseau blanc. I hope it is somewhere in my emails, but I don’t think so. Anyway, we return to the Alberta Aviation Museum! 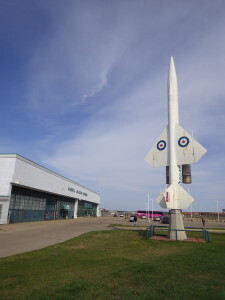 The Boeing IM-99B BOMARC missile outside the hangar that houses the Alberta Aviation Museum. Photo by author. 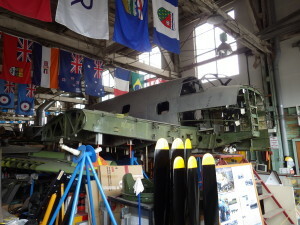 This museum has been in the news lately because they are in the process of acquiring a Lancaster bomber. When I was there in May, it seemed to be what was on everyone’s mind; what model, where it will be housed, what work will need to be done on it… It was all very exciting. “Such is the way to the stars” written (also in Latin) outside the museum. Photo by author. The passion of everyone involved at this museum shows, from our friendly greeting to an impromptu tour by one of the volunteers who didn’t even bother to finish his pre-shift coffee before showing us around. 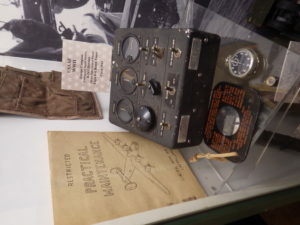 I have been to a couple of aviation museums, and I love seeing how each one shows the history and story of aviation. The Alberta Aviation Museum did not disappoint. Actually, I wasn’t sure if I was even going to get in! I had been trying to get to the museum throughout my holiday, and on the day I got back from Jasper, was dropped at the museum. Unfortunately, it was closed for a private event! But no worries, the next day a whole crew of us decided to go together and earlier in the day so we could spend as much time as we wanted exploring the museum. 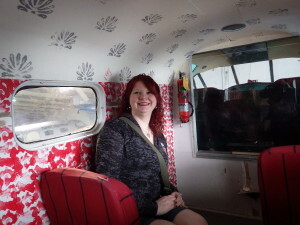 Inside the Norseman. Photo by Shannon K. Green. The group consisted of five adults of varying backgrounds, and two young children, and we all enjoyed ourselves. The kids particularly enjoyed the strollers shaped like airplanes, and I enjoyed encouraging airplane noises while we explored the museum. One also loved the “pretty lady” nose art. Not bad for 2 years old! (He also enjoyed the Disney nose art). 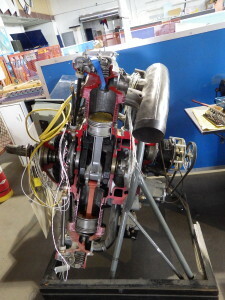 A cross-section of an engine. This was fascinating to see, and they hope to have it as part of the permanent exhibit soon. Photo by author. 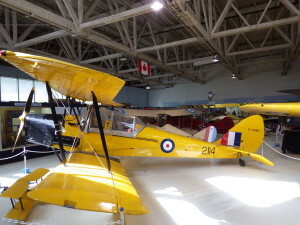 The Alberta Aviation Museum is located on the city airport property, which is now closed, in one of the hangars. This gives them a great deal of space to house a number of aircraft, plus space outside for some of their more modern features. 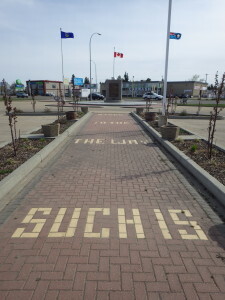 The exhibits along the walls look at Alberta’s role in aviation and World War II. 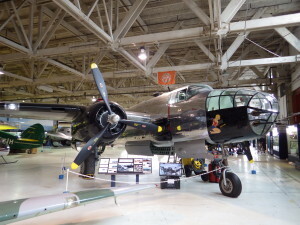 Such highlights include information about the first heavier than air flight in Canada, famous Albertan aviators such as Wilfried Reid “Wop” May, and Alberta’s role in Bomber Command. I’ll be honest, there was a lot of information, too much for one visit, so I’ll have to go back the next time I’m in Edmonton. It was nice to see some of these aircraft whole. That certainly doesn’t happen on my archaeological sites. Photo by author. Honestly, I had a great time in Edmonton, but this museum was a highlight. The staff were friendly and informative, and spent a little extra time with me when I told them what I do. It was wonderful to see the restoration area, especially the Ventura they are currently working on. Hopefully one day we’ll be able to restore the Ventura that crashed near Benton as they are restoring their Ventura. 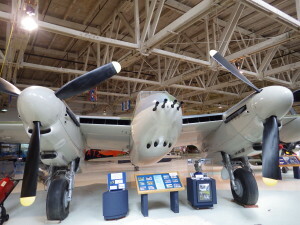 Some day it would be nice to open an aviation museum in St. John’s to compliment those scattered around Newfoundland and Labrador, and I certainly gathered a few ideas from my visit to the Alberta Aviation Museum. Can’t wait to get back! The Ventura being restored. Photo by author.